• Water pumping, drawing water from creeks or bores. It is obvious that a large scale wind farm is not practical for private use. Cost, Location and Practicality are just a few reasons for this. When looking at your energy requirments you need to look at your overall Natural Energy System. 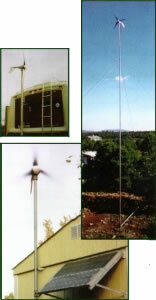 This is where a small wind turbine can be a great addition to your system. Supplement your solar generation, especially handy to keep the batteries topped up on cloudy days. Windmills have been used for hundreds of years, and as the technology improves they continue to be a great source of free energy.